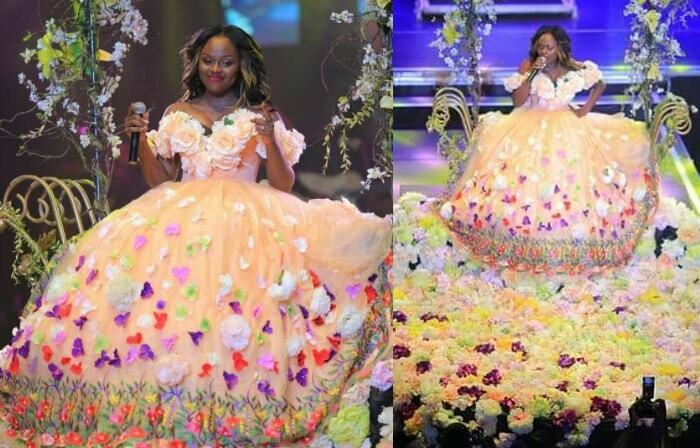 "The dress I made for Rema Namakula for her Banyabo concert. My inspiration for this dress was actually India. When you walk through the streets of India, there are flowers everywhere, there is colour everywhere. They even buy fresh flowers and decorate their cars. I got obsessed with flowers I kept thinking that when Kayla starts to see again, I will take her to miracle gardens in Dubai so she can see as many flowers as possible, that's why you will see so many flowers in my art pieces this year. I came to Rema with this idea and am so glad she took it up. Rehema Namakula aka Rema held her second concert at Serena Hotel on March 9, 2018, it was sold out. Her very first concert was held in 2013 days after being fired from the Gagamel Crew by Bebe Cool. On that day, Juliana Kanyomozi was holding her concert too at Serena Hotel.